Insights on our products, solutions and services. 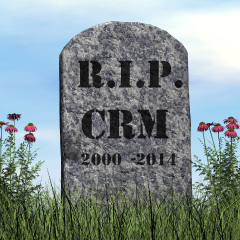 CRM Is Dead. Long Live CRM! Implementing CRM as a standalone application is a poor strategy and a bad idea. Integration is the key. The Customer Relationship Management (CRM) market is changing. The shift began in earnest in 2015 and is accelerating into 2016. Companies are changing how they evaluate their CRM application decisions. The focus now is on the integration of CRM with other parts of the business, particularly marketing and operations. CRM as an extended replacement of a customer contact system has run its course. CRM as part of an integrated front office solution is what the market is now demanding. Why is this? Companies who have implemented CRM as a standalone application are realizing that they have created an island—often a reinforced sales silo. Integration of the surrounding business processes still must occur, but they become manual operations and often tedious ones at that. Nothing dooms software adoption (especially by sales persons) as much as tedious, duplicative data entry. CRM implementation history is littered with such failures. But a CRM implementation that is integrated with marketing automation, social media tracking and Business Intelligence (BI) reporting tools can provide a powerful sales and marketing tool. Then couple it with customer service, order processing, fulfillment and accounting and you have built a systematized work flow engine that can significantly improve overall communication, decision making and operating efficiencies. Customize that engine to fit your particular business needs and strengths and you create an enormously effective competitive advantage. Bring that advantage to your customers and prospective customers and you disrupt your marketplace. This means that smart, strategic thinking businesses are realizing that they are not looking for a CRM implementation shop. Rather, they are looking for a CRM integration firm. You can tell the difference by the nature of the initial conversations. If the focus is on individual application feature sets and quick license sales, you are talking to an implementation shop. But if the focus begins with a discussion of your overall business strategy, your business needs and your present pain points, you are talking to an experienced integration firm. Yes, features and functionality play an important part of the final decision, but only when placed in the context of your business goals. And the most important features are ease of extensibility and integration with your other business systems. CRM as a standalone island is dead. CRM as a part of a strategically planned integrated software system is very much alive. Long live CRM!